The company Betsoft Gaming has inspired by the ancient Stone Age that took place in prehistory, where humans began to invent and create their own tools. The result was the 2 Million B.C. slot game, a betting machine that has interesting and creative graphics, which express in a unique, modern and colorful game. The bonuses, rewards, and prizes of this game are beyond the surface, therefore it is fun to play and experiment to know what this game is about. Although it is perhaps not the best slot machine game of the Betsoft Gaming Company, it is still a very cool and interesting way of entertainment for those who like simple games without very elaborate and difficult rounds as in other slot games. This slot of Betsoft Gaming has among its characteristics, thirty lines of payment, in addition to five rotating reels, the player must choose between one to five credits for each line of payment, whose monetary denominations are from 0.02 credits to 1.00 credits, being the maximum per spin up to 150 credits. Like most slots, 2 Million B.C. consists of spinning the reels and falling a predetermined combination of graphics to get a bonus, reward or unlock a special function, as the case may be. These graphs must be identical in the payment lines, to win credits the combination must go from left to right. Of course, the graphics have everything to do with the stone age, such as stone monuments, tigers, women in caves, a wooden mallet, a bonfire, a red colored gemstone, a diamond, a vase with the $ symbol in the middle. If more than two identical graphs fall together on the same payment line, you get a type of reward, in general. However, other prizes for combinations require more than just two equal graphics and maybe three or more in order to obtain a victory. As expected, there are some graphics that unlock extra features as well. The player should know that the fire pit graphics give him free spins, and to achieve this they must drop a minimum of three or more of these bonfire graphs in the same pay line. In addition to that, three graphs of the acorns on the spinning reels are able to activate the special attack bonus. 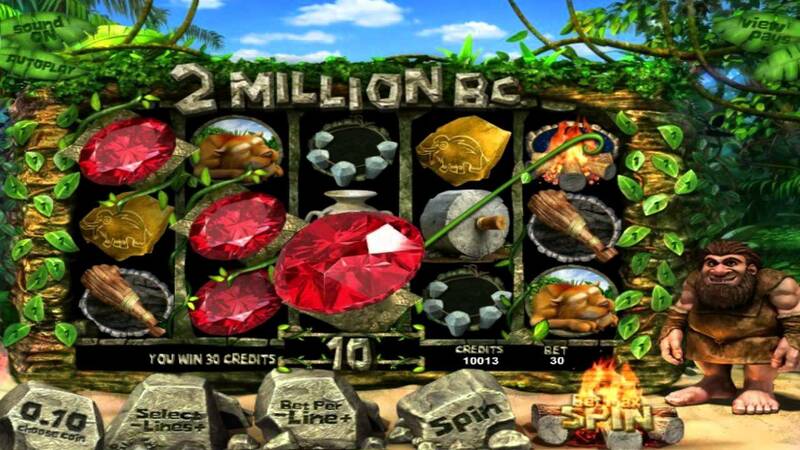 The 2 million B.C slot machines it is just one version of the series of slot machines from the company Betsoft Gaming. This despite having graphics, sound effects, not forgetting quite good animations, its newer versions have even more modern and appropriate effects to the present. Therefore, 2 Million B.C and its newest versions offer many extremely good, entertaining and interesting features. As for the screen, the game has a backdrop that reflects a natural landscape, visualizes the plants by the edges and the blue sky extremely clear and bright. The frame where the rotating lanes are is of different stones stacked one on top of the other with leaves between them. The reels are black; they are separated vertically, not horizontally. You can also see large rocks in front that make the information board, on top of these rocks you can read the bet lines and the amount of money bet on each of them, in addition to the spin button that would be the rock located next to the campfire with the option of maximum bet turn. Finally, you can also see the man who gives the image of the game, the protagonist, a man of the caverns. In addition to this, the game does not have many animations, the caveman will interact a little with the player and other characters that take place there, just as the fire will have its movement and sounds related to the animals and the environment that the game itself brings, jungle sounds and from time to time a lazy yawn on the part of the caveman when the player is taking a long time to continue with the next turn. You cannot lose sight of how the screen of the game will change at certain times to a night mode, where the landscape inspired by prehistory will change from a sunny day to a dark night when the player achieves the combination of graphics necessary to obtain the free spins. It is to be expected that the diamond chart would be the one that granted the largest of the bonuses. The bonus offered by the combination of these graphics reaches about 200 credits when after the turn of the reels fall more than three of these brilliant diamond graphics. Not only this but 2 million B.C. also presents another animation where the game screen can change in the middle of a bonus, showing the caveman want to take the diamond from the claws of the wild tiger. Help the caveman to get the diamond and be very careful with the wild tiger. The screen will present different options to take the diamond away from the tiger, the player must choose the safest option and guarantee a victory. If the player manages to help the caveman, this will give him an incredible prize. The player has many other chances to win prizes, for example, if you get at least five cartoons women’s graphics on the same pay line you can get one of the highest prizes. If you got the opportunity and after the turn got all the graphics of the woman of the caverns you needed, you can earn up to five hundred credits for each of the credits you bet. What is translated to that if the player made a maximum bet with the complete lines of payment can get to win 2,500 credits. Certainly, the woman of the caverns has a lot of power, but this is not all. There are more prizes of up to 400 credits for the wild tiger combination, 300 credits for obtaining at least five winged insect graphics. These different and very good 2 million BC payouts make up for the sad fact that there are no progressive jackpots in this slot game, so fans of the betting machines will still be attracted by this slot that offers so many winning opportunities. 2 million B.C has at least fifty thousand credits available in its free version; as fans of the pokies machines cannot miss the opportunity to try their luck with this game so simple, easy to play, visually attractive and generous. In addition, it should be remembered that it has multiple versions that would definitely be interesting to play them all, without leaving a single one out and find out which one is the big favorite. To get the real winnings that the game offers you need to bet real money, this slot is famous enough to be found in multiple land-based casinos. However, there is also the option of finding it in virtual casinos where entering the portal and subscribing to the team you can bet money in a simple way, in this way the company Betsoft Gaming made sure that this fantastic game 2 million BC will reach all hemispheres of the planet earth and be available to all kinds of novice players, fans and top players, those who like the casino environment on land or the comfort of a virtual casino. As for the screen, the game has a backdrop that reflects a natural landscape, visualizes the plants by the edges and the blue sky extremely clear and bright. The frame where the rotating lanes are is of different stones stacked one on top of the other with leaves between them. The reels are black; they are separated vertically, not horizontally. You can also see large rocks in front that make the information board, on top of these rocks you can read the bet lines and the amount of money bet on each of them, in addition to the spin button that would be the rock located next to the campfire with the option of maximum bet turn. In addition to this, the game does not have many animations, the caveman will interact a little with the player and other characters that take place there, just as the fire will have its movement and sounds related to the animals and the environment that the game itself brings, jungle sounds and from time to time a lazy yawn on the part of the caveman when the player is taking a long time to continue with the next turn. You cannot lose sight of how the screen of the game will change at certain times to a night mode, where the landscape inspired by prehistory will change from a sunny day to a dark night when the player achieves the combination of graphics necessary to obtain the free spins.